My thanks to Roc and NetGalley for providing me with a digital review copy. No compensation was provided for this review, and all opinions are my own. Disillusioned healer Blackthorn and her companion, Grim, have settled in Dalriada to wait out the seven years of Blackthorn’s bond to her fey mentor, hoping to avoid any dire challenges. But trouble has a way of seeking out Blackthorn and Grim. Lady Geiléis, a noblewoman from the northern border, has asked for the prince of Dalriada’s help in expelling a howling creature from an old tower on her land—one surrounded by an impenetrable hedge of thorns. Casting a blight over the entire district, and impossible to drive out by ordinary means, it threatens both the safety and the sanity of all who live nearby. With no ready solutions to offer, the prince consults Blackthorn and Grim. As Blackthorn and Grim begin to put the pieces of this puzzle together, it’s apparent that a powerful adversary is working behind the scenes. Their quest is about to become a life and death struggle—a conflict in which even the closest of friends can find themselves on opposite sides. In DREAMER’S POOL, Blackthorn made a bargain with the fey: in exchange for freedom from imprisonment, she would help all those who asked and not seek vengeance against the despicable chieftain Mathuin of Laois for seven years. This is a Herculean effort for Blackthorn, as her burning hatred of the Mathuin has been all that’s kept her going. With the help of her friend and companion Grim, Blathorn has kept her promise – but when the temptation to break the bargain proves too strong, what will become of the wise woman and healer? Juliet Marillier has the ability to write fairy tales that seem familiar, yet they remain unpredictable and captivating. The monster, locked in a tower. The beautiful leader of a people, desperate to slay the monster. The competing presence of Christianity and the old faith. All these elements are both common in fairy tales and present in TOWER OF THORNS, but the issue Geiléis faces still felt fresh and unpredictable. I don’t know how Marillier does it! 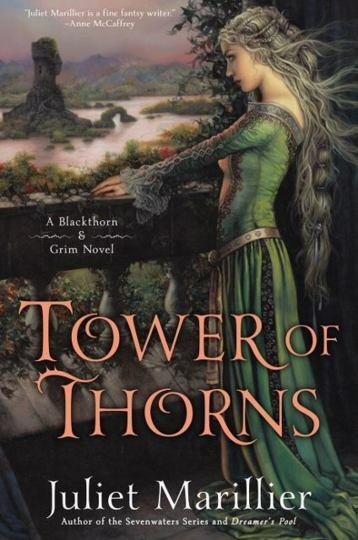 If DREAMER’S POOL was Blackthorn’s book, then TOWER OF THORNS is most definitely Grim’s. Grim completely stole the show, as we finally get some insight into this complex man. His backstory was absolutely tragic, and I’m not ashamed to say that tears were streaming down my face as I read his account of the horrible ordeal he survived. Many dismiss Grim as a simpleton, a “Bonehead” who has little to offer besides the intimidation factor his hulking presence provides. Fans of the series – and Blackthorn herself – know that this isn’t true, but it was pretty damn gratifying to see Grim getting some recognition. Just in time for the end of 2015, TOWER OF THORNS is the best book I’ve read all year. All you Juliet Marillier hold-outs, get your butts in gear and pick up the Blackthorn & Grim series! What did you think of Grim’s backstory? Would you be opposed to a romantic relationship between the two leads? If you haven’t read Blackthorn & Grim, what was the best book you read in 2015? Yay, I’m glad you loved this, too. I have to admit that l liked the fact that Blackthorn and Grim’s relationship was platonic in the first book, but this ending COMPLETELY melted my heart, and I’m shamelessly shipping them now. It was great to learn more about Grim’s past. It’s not what I expected, but it fits. He’s such a sweet, kind man. It’s a relief that Juliet Marillier can still write amazing adult fantasy after her somewhat disappointing YA novels. I hope you have time to read more of her books next year! I loved it sooo much! YES, join me on the dark side, where we ship characters who start out as friends. 😉 I mean, this is Juliet Marillier we’re talking about here. There’s got to be a swoon-worthy romance in the works…right? Grim’s background was such a shock! I had some theories brewing about where he came from/what his story was, but I couldn’t have been further off the mark. HA! I know exactly what you mean. Her books are pretty dark. But the thing I like best about Marillier is that she always manages to me feel hopeful after those more tragic moments. YAY I adore this series more with each book. The atmosphere was deliciously dark and old timey fairy tale with this particular book, I loved it. The relationship between Blackthorn and Grimm is also TOO PERFECT. Me tooo! I’ve heard some people say that they didn’t enjoy Tower of Thonrs as much as Dreamer’s Pool, but I loved them both – and I may have even preferred ToT. I honestly think that Juliet Marillier writes the best relationships in fantasy – familial relationships, friendships, and romance alike. Marillier forever! !